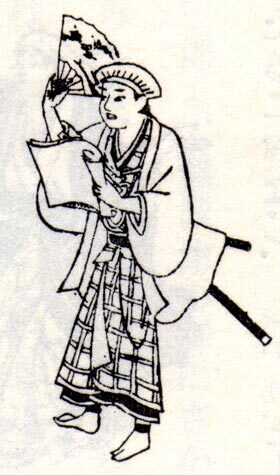 Before 1690: he started his career as a disciple of Fujikawa Buzaemon I, who gave him the name of Fujikawa Matashirô. 1691: he became a disciple of Yamashita Hanzaemon I and changed his the name to Yamashita Matashirô I. 1st lunar month of 1695: Matashirô played in Ôsaka the role of Ogata Hachirô Tokikuni in the drama "Jingû Kôgô", which was produced by Arashi San'emon II. Fall 1696: Matashirô went to Edo. 11th lunar month of 1696: Matashirô played at the Ichimuraza the role of Tamanaga Heinojô in the drama "Keisei Natorigawa"; his stage partners were Mizuki Tatsunosuke I, Miyazaki Denkichi and Tanishima Mondo. 2nd lunar month of 1697: Matashirô's rank in the Edo hyôbanki, tachiyaku section, was jô (superior). 1698: Matashirô went back to Ôsaka. 3rd lunar month of 1701: Matashirô's rank in the Ôsaka hyôbanki, tachiyaku section, was jô-jô (superior - superior). He shared the same rank with Kataoka Nizaemon I, Osagawa Jûemon, Shibazaki Rinzaemon I, Sakurayama Shôzaemon I, Takioka Hikoemon and Murayama Heijûrô I. Winter 1711: Matashirô appeared on stage for the last time, in Kyôto, playing the role of Suminoe Mondo in the new year drama "Onna Shôjô". He retired and took the tonsure in an Ôsaka Temple, calling himself Sôkan. 3rd lunar month of 1711: Matashirô's rank in the Ôsaka hyôbanki, tachiyaku section, was jô-jô-(shiro)kichi (superior - superior - (white) excellent). 18th day of the 1st lunar month of 1717 : his second master Yamashita Kyôemon I died. 3rd day of the 3rd lunar month of 1729 : his first master Fujikawa Buzaemon I died. 9th day of the 8th lunar month of 1736 : the priest Sôkan died in Ôsaka. Yamashita Matashirô I was a Kamigata tachiyaku actor, who made a 20-year long career from the beginning of the 1690s to the beginning of the 1710s. He was quite popular but preferred to retire at the age of 50 to become a Buddhist priest and enjoy more than 25 years of peacefulness. As an actor, he excelled in budôgoto roles and yatsushi dances. His wife was the sister of Iwai Hanshirô III. The 9th day of the 8th lunar month of the 1st year of the Genbun era was the 13th of September 1736 in the western calendar. The 18th day of the 1st lunar month of the 2nd year of the Kyôhô era was the 28th of February 1717 in the western calendar.